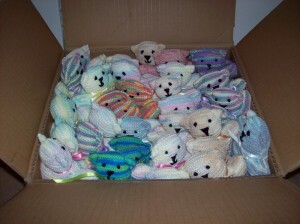 Castle Hill Police were pleased to receive assistance from Arjay Creations today with the delivery of a whole box of special “Trauma Teddies“. These cuddly knitted bears provide invaluable assistance with the comfort of children across a wide range of circumstances. Whether dealing with accident trauma, the facilitation of family disputes or helping to keep the young ones busy while adults are required to attend the station for lengthy periods the teddies are a real hit. Here Senior Constable Sedger is seen receiving the teddies and she will make sure they are on hand to help out whenever there’s a need for them to perform their public duty. 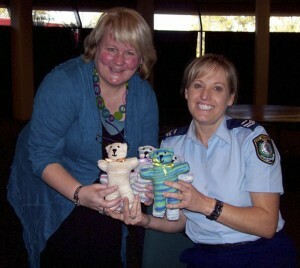 The “Trauma Teddies” program is an ongoing partnership between the local area command and Arjay Creations.